No-Bake Strawberry Lemonade Cheesecakes are perfect for a princess birthday party or your next barbecue. Delectable berry and citrus flavors make these individual desserts impossible to resist! This post is sponsored by Challenge Butter. The views and opinions expressed on My Baking Addiction are my own, and based upon my experiences with Challenge Butter products. I hope you’re not rolling your eyes at yet another no-bake cheesecake. Admittedly, I’m pretty obsessed with them. And I’m not even remotely sorry about it. In my mind, no-bake cheesecakes are synonymous with summer – they’re pretty much the adult equivalent of Screwballs from Mr. Softie. If I’m completely honest, Screwballs from Mr. Softie are still amazing as an adult. I would totally nosh down on one every. single. day. if our ice cream man didn’t smoke cigarettes as he drove through the neighborhood. There’s something about the familiar sound of the ice cream truck followed by a trail of smoke that can squash cherished childhood memories – immediately. The beauty of no-bake cheesecakes is that they only require a handful of ingredients and they come together in minutes. And, hello – it’s cheesecake that didn’t require you to turn on your oven – how could you possibly resist? 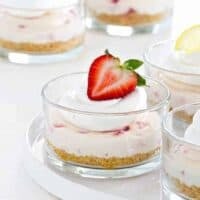 I used fresh strawberries and lemon juice to really give these cheesecakes an absolutely huge pop of flavor. When I say you’re gonna love these, and make them more than once this summer, I mean it. We already have them on the menu for a second time this week. Strawberry and lemon is a flavor combination Eric can’t get enough of. Best of all, these treats can be made ahead of time. You can dish these individual cheesecakes is small mason jars, then just slap lids on and stick them in the fridge until you’re ready to transport them to the neighborhood barbecue or a picnic. 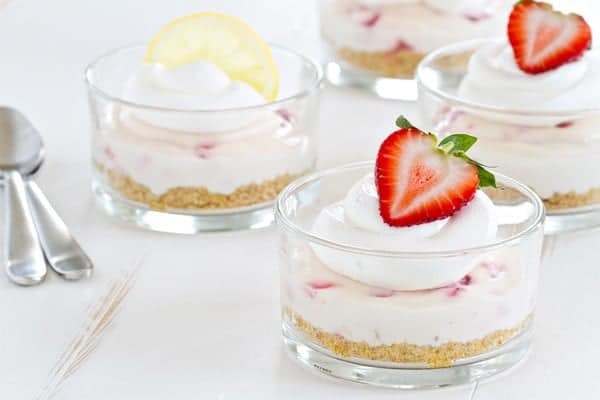 These No-Bake Strawberry Lemonade Cheesecakes are made with Challenge butter and cream cheese. I’m excited to partner with Challenge Butter as part of their ambassador program. If you’ve never tried Challenge Butter – you most definitely should. It’s made with 100% real cream, so there is nothing artificial about it. And it’s made from cows not treated with the Growth Hormone rbST. I can feel good about eating it, and so can you. From No Bake S’mores Cheesecake to No Bake Cookies and Cream Cake, I’ve got a no bake cheesecake recipe for just about everyone. This Strawberry Lemonade version has shot straight to the top of my favorites list. I hope you love it! In a large bowl with an electric mixer, beat cream cheese for 2-3 minutes. Add in sweetened condensed milk mix until smooth. Make sure to scrape the sides of the bowl with a rubber spatula to ensure the cream cheese is fully incorporated. Add in lemon juice and vanilla and beat for an additional 2-3 minutes until smooth and creamy. Fold in strawberries. Evenly spoon mixture into prepared serving dishes, cover and refrigerate for at least 4 hours. Before serving, top with whipped cream, strawberries and lemon slices. 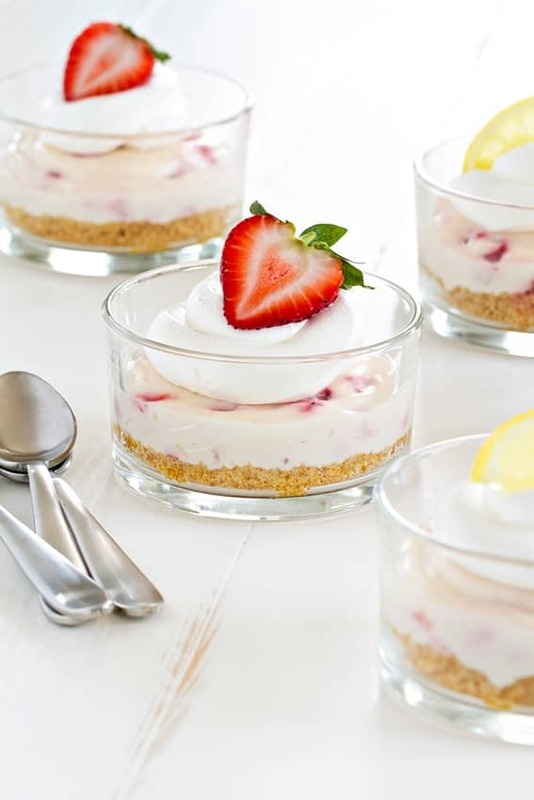 Strawberry Lemonade Cheesecake can be stored within the refrigerator for up to 3 days. Beautiful, gorgeous, easy and delicious, this are the summer type recipes that I enjoy so much. Love the flavors, and also will give that delicious butter a try! These are so surprisingly easy and totally delicious! I have a baby shower coming up for a friend expecting a girl, and these would be perfection :) Pinning! Thanks so much, Medha! These would be so perfect – especially done in cute little mason jars! When do the 3/4 cup hulled and chopped strawberries get added? I just fixed that, somehow it got cut off in step 4. Thanks for pointing it out to me – have a great day! So SO pretty. No bake is a must in the summer! easy to make! glad i bumped onto your website… il be checking everyday for inspiring ideas. cooking has always been my stress reliever, i like it to art!! I am so happy you came across my blog! Baking is definitely a stress reliever for me too. Happy baking! Totally craving these cheesecakes! So pretty and oh so delicious! Thanks so much, Miss! They are so darn easy too, which is always a bonus! It was 117 degrees last week where I am, so um…I can get all the no bake treats possible. And one can never have enough Challenge butter in their life! Yikes! That is HOT! I hope these little no-bake treats help you cool off – just a bit! Thanks for stopping by! No bake, strawberry, and cheesecake. The best! I couldn’t agree more, Dorothy! Thanks so much for stopping by! This is the kind of dessert that my family goes crazy for. I love how easy they are too! So darn easy, which makes them absolutely perfect for summer! Thanks for visiting, Lori! Mine too, Jocelyn! Thanks so much for stopping by! I’m totally smitten by these. I love desserts in a glass, not only pretty but also so practical. And these are perfect for the ehat wave we are going through at the moment. Thanks so much, Oana! I appreciate you taking the time to stop by! Have a great day! You can never have too many no-bake cheesecake recipes. It is summer after all. Love these adorable little cakes. Pinned. I couldn’t agree more, Jennie! Thanks for stopping by and pinning! I’m with you on the no bake cheesecakes, the more the better. I would never get sick of them, especially when yours are always so pretty. This recipe is amazing and the photos are stellar. 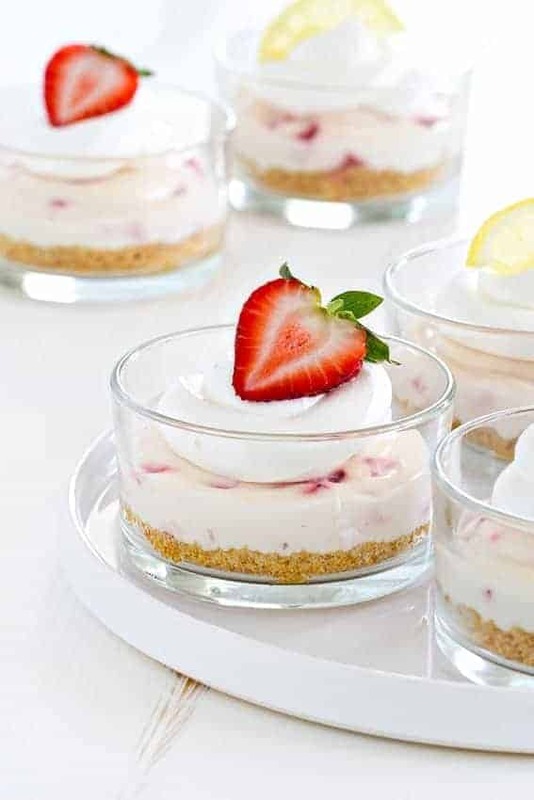 I have a sudden craving for no bake strawberry lemonade cheesecakes! This recipe was fantastic! I love how the lemon flavor just pops without being to tart. I added homemade strawberry syrup to the crust to give it a little something extra. Thank you so much for this recipe.